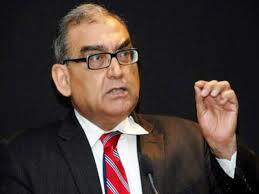 Justice Markandey Katju, former chairman, Press Council of India and ex-Supreme Court judge, has filed a writ petition in the Supreme Court against Lok Sabha and Rajya Sabha resolutions condemning his Facebook posts which had called Mahatma Gandhi and Netaji Subhas Bose British and Japanese agents, respectively. He has filed the petition through senior counsel Gopal Subramaniam, as he is abroad. The petition, a copy of which Katju has posted on his blog, says that the resolution condemning him has caused "grave and irreparable harm" to his reputation and life’s endeavour to "uphold the Constitution and the rule of law". It adds, though he addressed a representation via email to the speaker and the chairman of the Lok Sabha and the Rajya Sabha on March 23, 2015, saying he was denied a hearing, he "received no response thereto." Hence, Katju says, he had "no other alternative" except to go in for an "instant" writ petition. "At the time the resolutions were passed", the petition says, he was not physically present in India, and "has not returned to India as of the date of filing of this petition and therefore the affidavit in support of this petition is being filed by the Petitioner’s next friend present in India". Claiming whatever he had said on his Facebook posts on Gandhi and Bose on March 10, was part of his "keen interest in academics", Katju repeated what he said. Thus, Gandhiji "constantly using religious symbolism in politics for several decades", which "in effect furthered the British policy of divide and rule by alienating the Muslim population of the Indian sub-continent away from the national movement", Katju says, adding, as for Netaji, through his actions, "he ended up perpetuating Japanese imperial interest in the Indian sub-continent." Saying that the statements, as a private person, "are academic in nature and are in fact a manifestation of scientific temper of a citizen", Katju, interestingly, qoutes from Jawaharlal Nehru's "Discovery of India" in his favour. Nehru, in the book, had talked about the need for "search for truth and new knowledge, the refusal to accept anything without testing and trial, the capacity to change previous conclusions in the face of new evidence, the reliance on observed fact and not on preconceived theory..."
Insisting that "inculcation of scientific temper has since been included as a fundamental duty in Article 51-A (h) -- “to develop the scientific temper, humanism and spirit of inquiry and reform” -- Katju quotes the Constitution of South Africa (1997) which explicitly provides that "everyone has the right to freedom of expression, which includes.... academic freedom and freedom of scientific research." He adds, "This to be read along with Article 51-A (h) of the Constitution of India, which embodies similar foundational values." According to Katju, "Academic freedom to explore significant and controversial questions is an essential precondition to fulfil the mission of educating and advancing knowledge. Academic freedom is necessary not only for faculty members in formal teaching setup but is also necessary for every citizen pursuing spirit of inquiry so that he or she can contribute to the society." He adds, "The clash of competing ideas is an important catalyst, not only for the expansion of knowledge but also in development of independent critical judgment. Academic freedom encourages new knowledge, different perspectives, competing ideas, and alternative claims of truth, and therefore, to straightaway condemn a person reaching an alternative conclusion on the basis of his personal study is constitutionally impermissible."